Blog Mystery: 撮ったのかよ or エーアイアイ ? The way the ear hears things can be very different, an interesting concept regarding listening comprehension in general. There’s a sound clip that roughly half of people hear one way, while the other half hears it completely differently. It was featured on an episode of 探偵！ナイトスクープ (A show where “investigators” read letters that viewers send in, and then attempt to solve a mystery or problem). I hear the clip one way, and my fiance hears it completely another way, which is the same results as those who were asked what they heard in the episode. I probably would have dismissed this as nonsense if we both heard it the same way, but found ourselves in a debate of what the sound clip was saying. The episode initially suggests that younger people and westerners might be more likely to hear エーアイアイ opposed to 撮ったのかよ, but searching for clips on YouTube and reading the comments left, I’m not sure that’s really the case. If you listen long enough and I suppose depending on how much mind control and how good your ears are, you should be able to “switch” the way you hear it, sort of like an optical illusion– but no matter how much I try I only hear it one way. It drives me crazy! 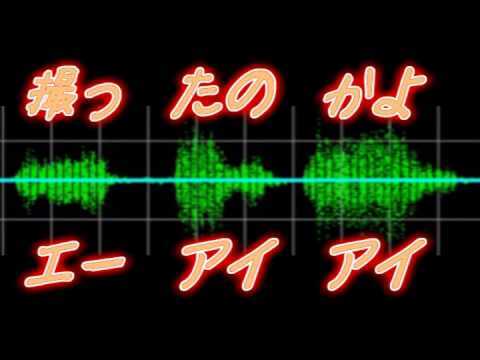 Below is the sound clip: there will be a camera shutter noise, and then the voice will either say 撮ったのかよ！ or エーアイアイ, depending on which way your ears decide to hear it. It’s also worth mentioning one voice is male and the other is female. (If you don’t read Japanese, the voice will either say “Totta No Ka Yo!”, or “A. I. I.”). Mystery: What do you hear? Please vote below!